What classic science-fiction show inspired Star Wars? What company does Patrick Stewart hate? Who is "Inspector Spacetime?" 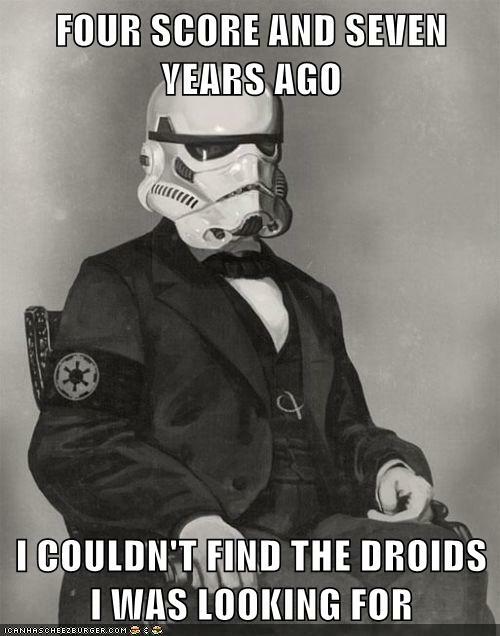 What if Abraham Lincoln were in Star Wars? 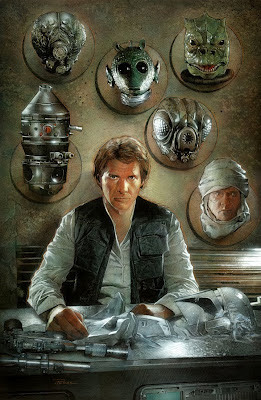 Check it out in this week's "Geek Bits." This week Patrick Stewart took to Twitter to complain about Time Warner taking forever to install his cable. All I wanted to do was set up a new account with @TWCable_NYC but 36hrs later I've lost the will to live. The company contacted him to try to make amends, but it was too late. Captain Picard is now a happy Dish Network subscriber. Thank you @dish for rescuing us from the Faustian @TWCable_NYC with your prompt and professional service. This is a new world now. Others listen when people complain on Twitter. The whole world listens when Star Trek captains complain on Twitter. Even Peter Sciretta from Slashfilm tweeted about his frustration with Verizon and it affects my view of the company. TOSSUP: Are you more or less likely to subscribe to Time Warner after Patrick Stewart's tirade? I first heard about this from He Geek She Geek since I don't watch Community regularly (need to fix that obviously). It's an obvious Doctor Who parody called "Inspector Spacetime." Here's the second episode. Actor Walter Koenig, who played Ensign Chekhov on Star Trek: The Original Series, says his show helped inspire Star Wars. He said "When finally ran out of air on in 1969, we concluded that it was the end of Star Trek. But when George Lucas saw the effect we had on the public, he was inspired to create Star Wars, and that in turn brought the people of Paramount around to saying, what do we have to make a feature and perhaps a franchise out of? And then they remembered they had Star Trek. So one thing feeds off another"
As much as I love Star Trek I think that's preposterous. Sure all science fiction inspires others but the connection is weak at best. One this is for sure. Without Star Wars, Star Trek: The Motion Picture might not have happened. ODDSMAKERS: What are the odds that Star Trek TOS inspired George Lucas to create Star Wars? I say 35%. What do you think of today's links? Any big news you wanted to talk about this week? I think it's possible that Star Trek lit the spark that led to Lucas creating Star Trek. Besides them both being in space with ships, there's not much else in common though. Not the only one Natasha. "It ends here! No further!" 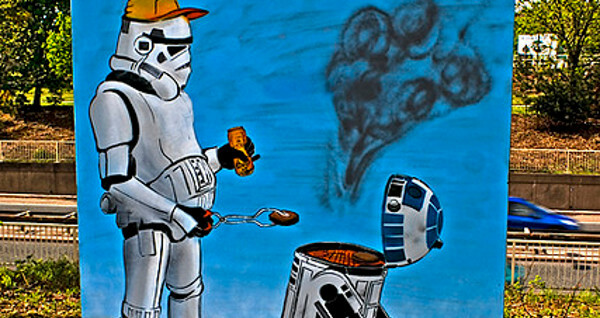 Alex there is a BBQ made out of the Death Star. Although I think that might be too ironic. I don't have Time Warner in my area so I suppose that would be a 0% chance. But really if I b***hed about Time Warner no one would care. I remember an article recently about Alan Alda wrote to a newspaper about his experience trying to get technical support on something. I think we need a site for "Grumpy Old Celebrities" where they can complain about all these whippersnappers taking to long to fix their stuff. Anyway, I don't know if Star Trek inspired Star wars (I'd give it a 10% chance) but according to a guy in the movie "Free Enterprise" Star Trek was just a ripoff of Voyage at the Bottom of the Sea (or whatever that old show was called) except instead of in a submarine it was in space. LOL Pat. Although 36 hours is a long time to wait for the cable guy. I never thought about Voyage as an inspiration for Star Trek. I always heard Wagon Train. Food for thought. 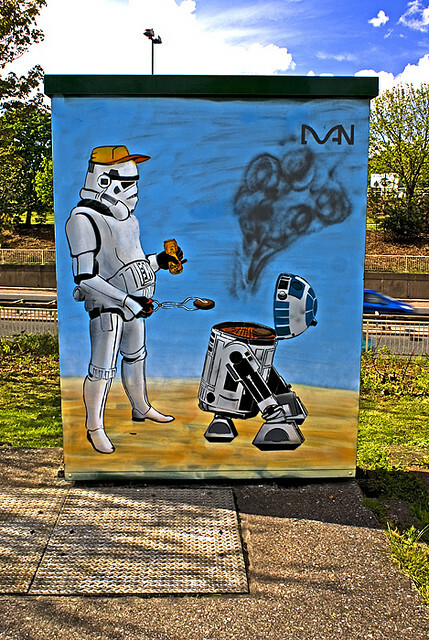 I see he put R2 to good use! Someone should make grills like that.